Have not be able to save new play so this is the last state I have before I lose the profile, thanks god I have a back up. 60 days left in this tour. This reply was modified 1 year, 11 months ago by Rob, aka easthulltiger. I like to kill a lot. I only play combat-based missions and emphasis the violence of action above all else. As a result, all of my missions are 45%+ heat. High risk, high reward. Good to see everyone has rather low Average casualties. Doesn’t seem like a bad stint to be under your various commands. 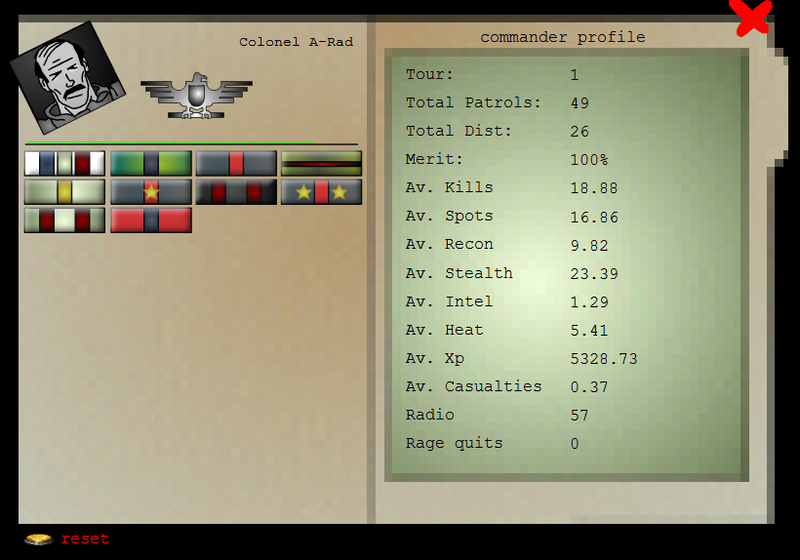 Last profile I had was two tours long and my casualties were about 0.94 XD, yeah my men died a lot because I would not wait for my Heat to go down and I would basically only do Firebase missions defense or attack. The top brass actually sent a memo saying I was losing too many men. Damn! Brother! 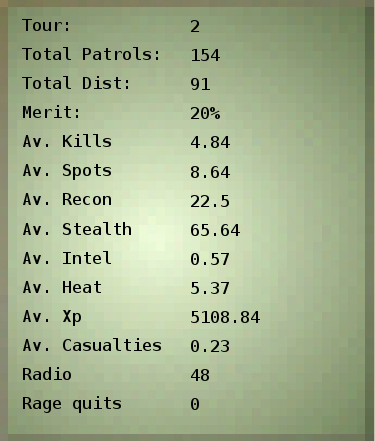 ( @mexicanbatman ) How can you get to such high average exp like that, that is amazing. !4 in a row as of Dec24 2017. I figured out how to save my profile and can now rank it up. My heat score is at 0% and my intel is at 111. So far 3 purple hearts and all my men are alive. Ranking with stealth and spot and combat and a single viet skill. Doing lot’s of recce missions to cover AO% and keep heat low i tend to be on mission for 2-3 hours and carry a radio with two batteries and use them both in every mission. This reply was modified 1 year, 3 months ago by Jordan. I managed to make 25 games and got my M-16-M203 for the first time ever in all the years that i have played MNBR. I am a very happy. I also got the HVT for the very first time in the same mission it was in my LZ and i got what i think was a fairly good After Action report on the mission. Along with a pretty good unit of guys. I read so much darn stuff on recondo and LRRP units to get this far. Darn game is so hard. Good job urbs. My goal is the Green Beret and the NV scope and the 50 Game ribbon. 306 days remaining…We’ll see. I achieved the Master Recon Ribbon today. I am proud of that one. This reply was modified 1 year ago by Jordan.